← Prostrations to the Root Lama! 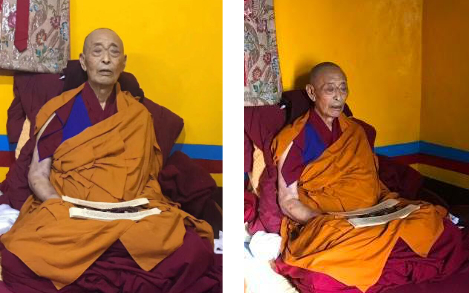 On September 14th, 2017, the spiritual leader of all Yungdrung Bön and head of Tashi Menri Monastery in Dolanji, India, His Holiness 33rd Menri Trizen Lungtok Tenpé Nyima Rinpoche entered into a state of tukdam at his lama residence at Menri Monastery. In general, tukdam refers to a state of meditative stability attained by meditation masters that continues after the external breath of their body has ceased but the internal breath, or winds, remain. Therefore, the subtle channels through which these winds move remain stable. The area of the body containing the heart chakra remains warm to the touch. The skin remains soft, and the face retains a glow of vitality. Often, the master is sitting in meditation posture, but can also be in the yogic posture of the “sleeping lion” lying upon the right side of the body, knees together and slightly bent with the right hand under the head and the left arm resting upon the body. During this time, great care is taken to not disturb the body or interrupt the state of mediation. Great blessings can be received by connecting with the master during this important time. After an indeterminate number of days, the internal winds cease, the channels collapse, the physical body slumps, and the warmth dissipates from the heart center. 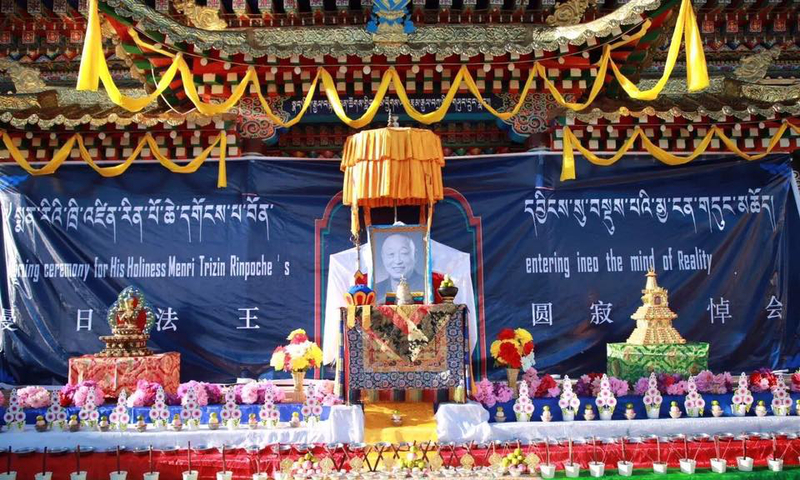 For His Holiness 33rd Menri Trizen Lungtok Tenpé Nyima Rinpoche, he ended his state of tukdam after five days on September 18th, 2017. At that time, chants related to the cleansing of the sacred body are recited while the physical remains are ritually bathed with water mixed with special herbs. Sacred seed syllables are then written on the body and the body is wrapped in a pure white cloth. Disciples who connect with the lama during this time either by being near the sacred remains or at a distance, can receive great blessings. 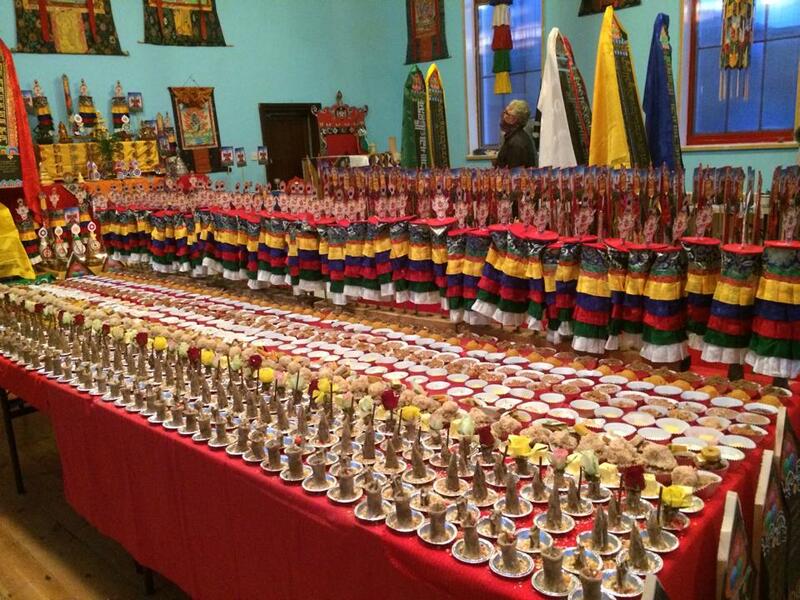 Tsok offerings after the passing of His Holiness 33rd Menri Trizen Rinpoche. Photo credit: Unknown. Because the master has attained a state of enlightened realization, the prayers and rituals that are offered during this time are different than that for an ordinary being. Rather than offering prayers to support their experience of death, disciples focus upon practices to honor the teachings of the master. These prayers and practices include performing acts of virtue to benefit all beings, reciting aspirational prayers such as the Tséwang Monlam found at this link https://ravencypresswood.com/2017/09/14/tsewangs-precious-mala-of-meaningful-aspiration-prayers/, and practicing guru yoga in a pure and fervent way. Additionally, the monastic community offers many tsok, or sacred feast offerings. At the time of cremation, an elaborate fire ritual called Kün Rik is performed during which a wide variety of offerings are presented to the entire cycle of deities. Although the master has attained the ultimate state of realization and therefore does not experience the 49 days of transiting the bardo, the 49 day period is still observed as a time to continue with prayers, spiritual practice, renewal of vows, and acts of virtue in order to honor the teachings and spiritual guidance of the master. 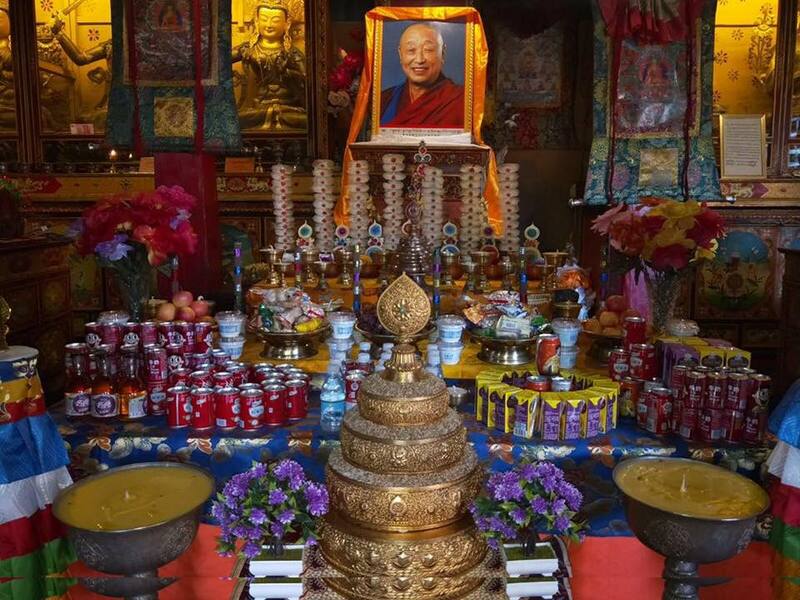 Posted on September 20, 2017, in Prayer and Ritual, Tibetan Lamas, Uncategorized. Bookmark the permalink. 4 Comments. Thank you, Raven. I am truly blessed to bear witness with the sangha to this wonderful transition.